The south-east side of the temple mount. 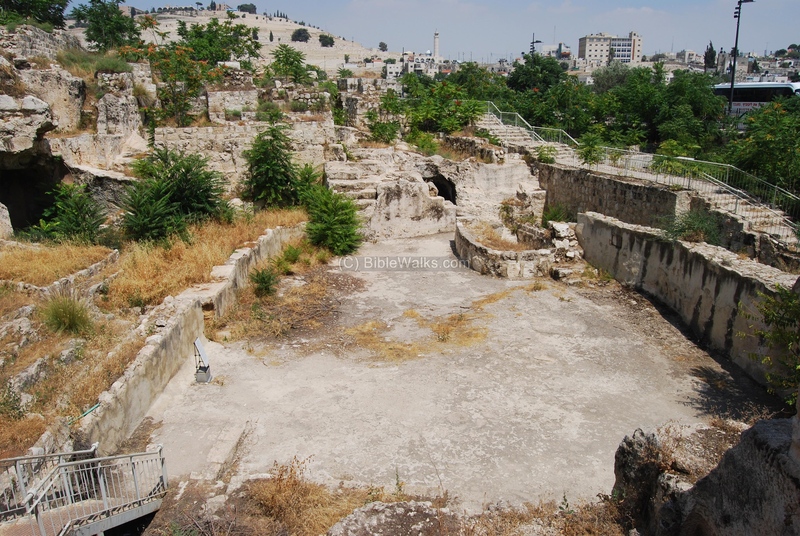 Excavations revealed the Hulda gates, monumental staircase to the temple, cisterns, residential houses and fortifications. 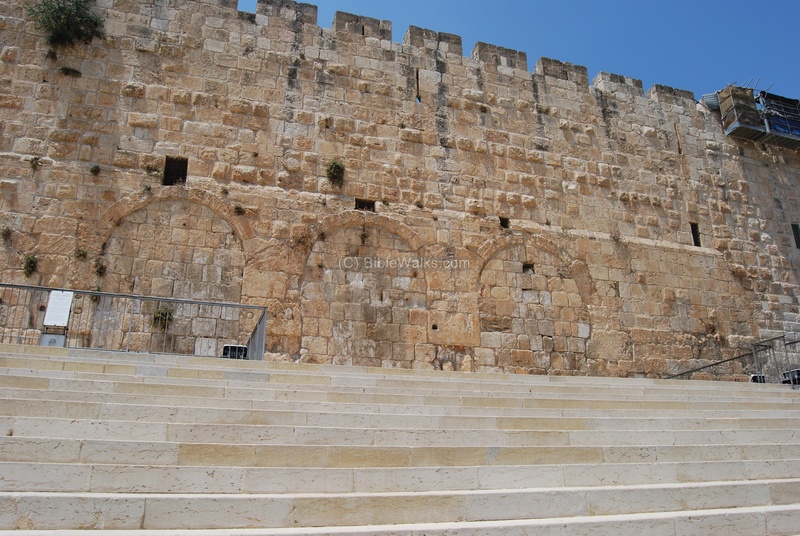 2 Chronicles 27:3: "He built the high gate of the house of the LORD, and on the wall of Ophel he built much". Excavations of recent years have unearthed amazing structures related to the second temple in the south-east side of the temple mount, including the flight of stairs leading to the temple, the gates that led to the temple, and ritual baths, cisterns, residential houses and fortifications. 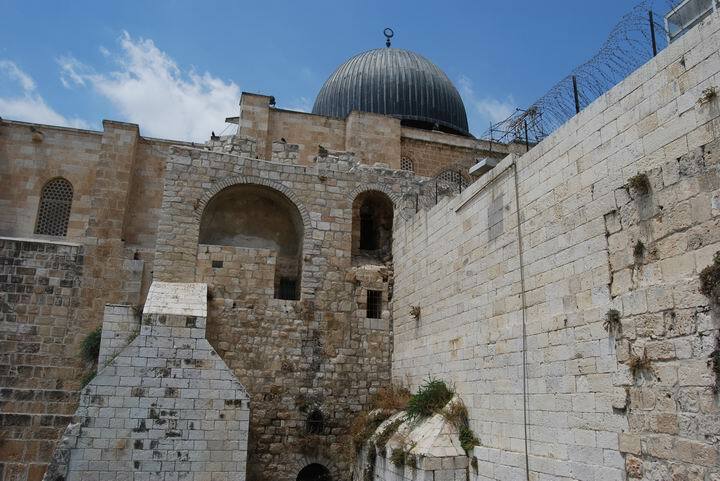 The area is located on the south-east side of the temple mount, inside the old city. The area is approached through the Ha'Ashpathot (Dung) gate which is located on the south side of the area, which is today an Archaeological park. The southern side of the temple mount was built and fortified from the Iron/Israelite period. 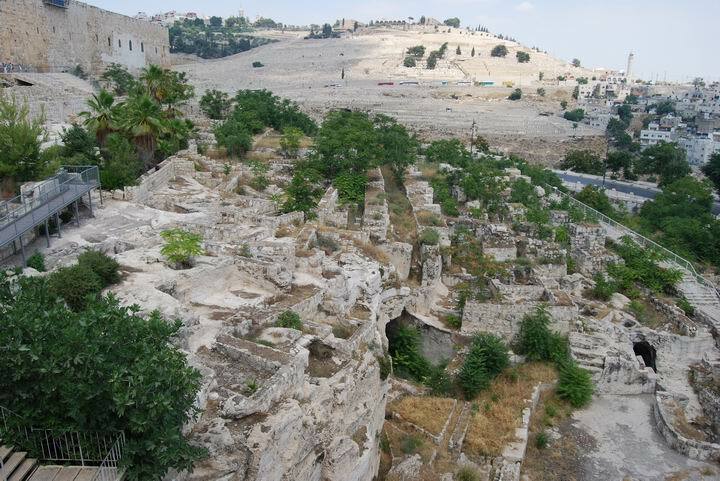 The site was referred in the Bible as the "Ophel" (the high place) - meaning the upper city (acropolis) of ancient Jerusalem. Parts of the Biblical walls and rooms were found in the archaeological excavations at the site. The excavations also revealed several layers of structures from later periods, most of them from the Hellenistic period (Hasmonean Kingdom) and Roman/Byzantine period. The grand structures are from the early Roman period: Herod the Great, King of Israel under the Romans (37BC - 4BC), enlarged and rebuilt the second temple, and made it a magnificent temple. Part of the temple infrastructure were the main gates to the temple, called the Hulda Gates. A monumental staircase was added to enable the thousands of pilgrims to walk into the temple. 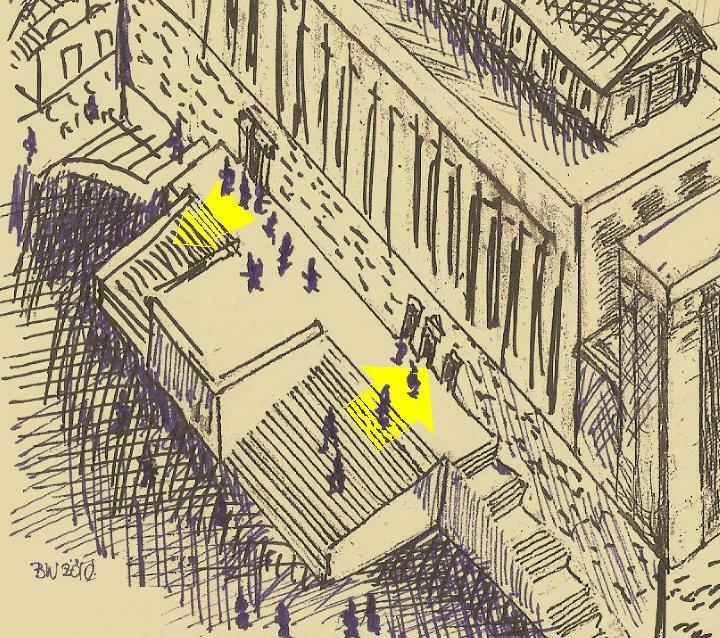 The location of the gates is indicated by a yellow circle on the illustration of the reconstruction of Herod's temple, dated to the end of the 1st C BC. The Hulda gates are located 6M above the level of the southern street, and their total length is 15M. Dozens of ritual baths were part of the installations around the entry, so the visitors can purify themselves before entering the Holy site. 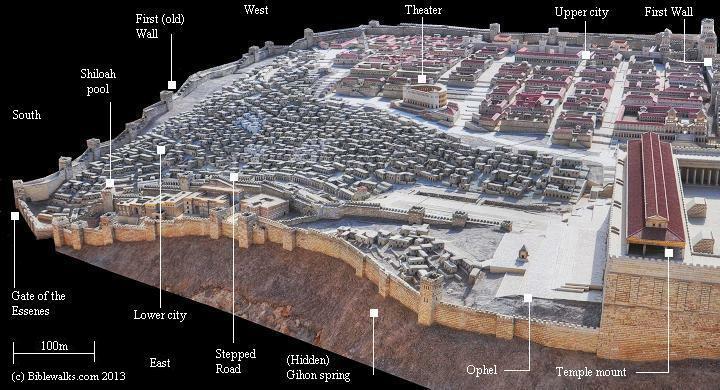 A model of the Herodian city is shown here, focusing on the south side of the city. 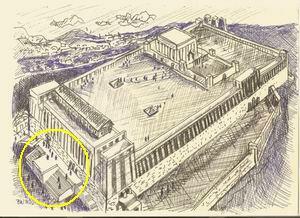 The Ophel and the Hulda gates are on the right side - the southern wall of the temple mount. The destruction in 70 AD, after the Jewish revolt against the Romans, left most of Herod's second temple structures in rubble. Their location was lost until recent explorations (19th C) and excavations (20th-21st Century). 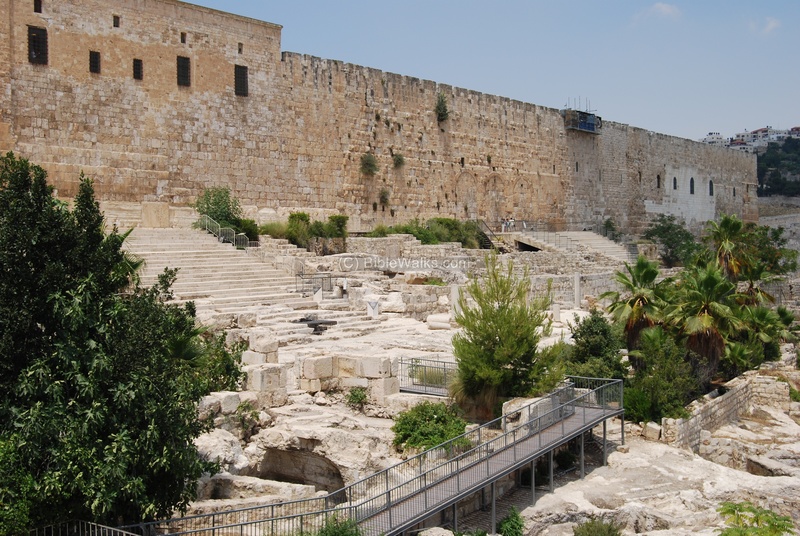 For more info: A special web page reviews the gates and bridges of Herod's grand temple. Jerusalem returned to the control of Israel following the six-day-war (1967). The Ophel and Hulda gates were excavated in the 1970s by Meir Ben-Dov and Benjamin Mazar, in 1986-1987 by Eilat Mazar, and by Ronnie Reich and other Israeli archaeologists (1994-2000). Today the area is part of the Southern wall archaeological park and open to the Public. The following photo shows a general view of the south-eastern side of the temple walls. On the left and center side are the Hulda gates. Leading to them are the reconstructed monumental staircase. 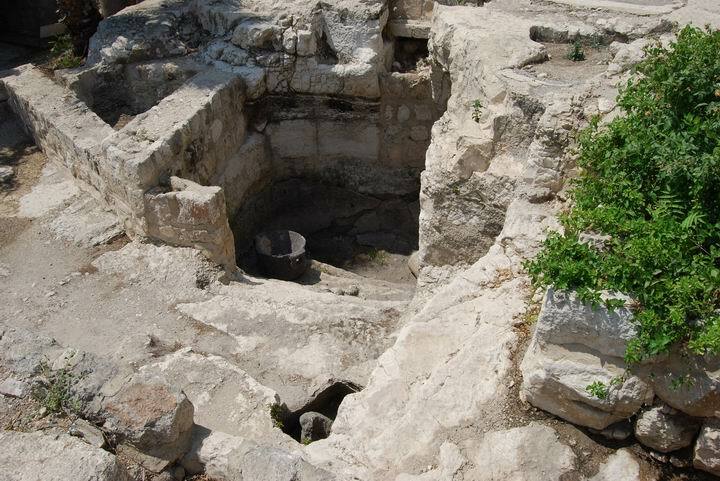 On the bottom right side are some of the ritual baths and cisterns found in this area, part of the installations that were used by the visitors to the temple. 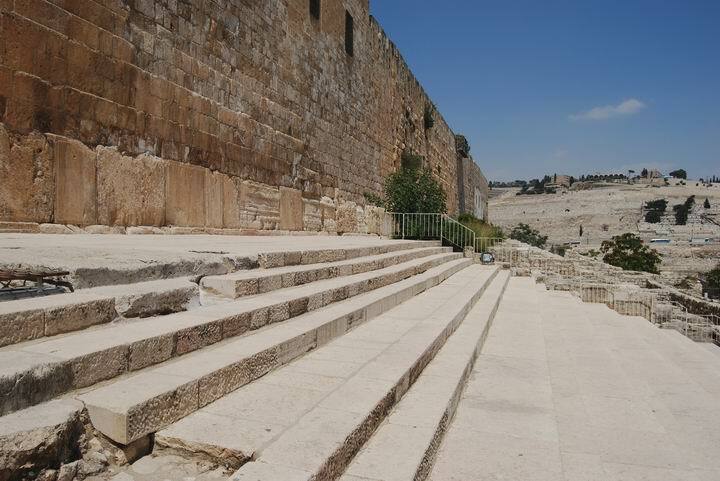 One of the most important findings of the Southern wall excavations is the monumental flight of steps leading up to the second (Herodian) temple mount, through the Hulda gates. The staircase consists of 15 pairs of alternating broad (90cm) and narrow (30cm) steps. Although most of the steps were reconstructed, this is one of the remains of the southern entrance. 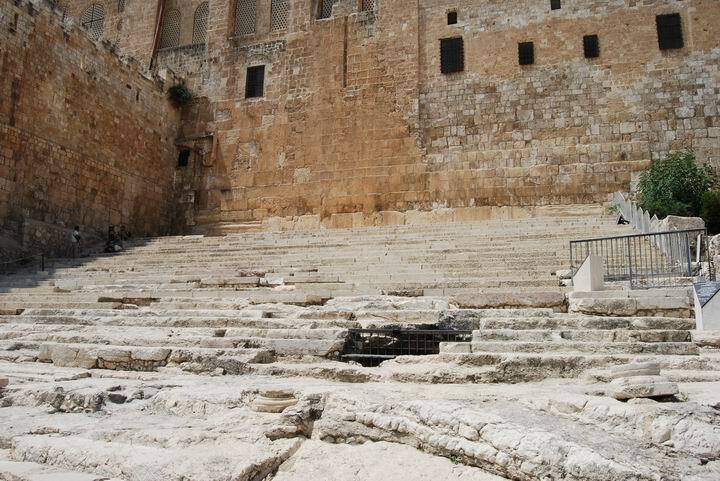 A closer look on the stairs is seen below, with Mount of Olives on the background. The steps are arranged in a pattern of broad-narrow step, probably intentionally in order to force the climbing visitor to the temple to look down in order to follow the steps - thus seeming to bow to the holiness of the great temple. 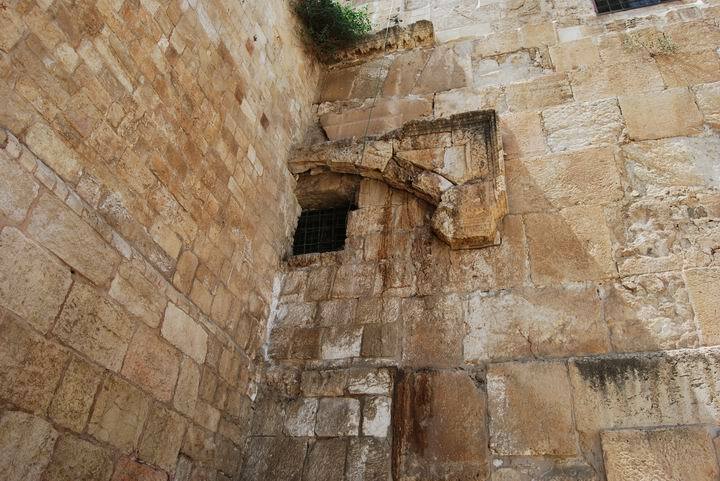 With little doubt, the entrance of Jesus into the temple mount was through these steps or through the entrance above the Robinson arch. After climbing up the stair case, there were 2 gates on the southern wall, called the Hulda gates. These are referenced in the bible and the Misha (see reference below: "Five gates were in the temple mount: the two Huldah Gates on the south, that served for coming in and for going out..."."). The gates led to tunnels that led under and up into the temple mount. 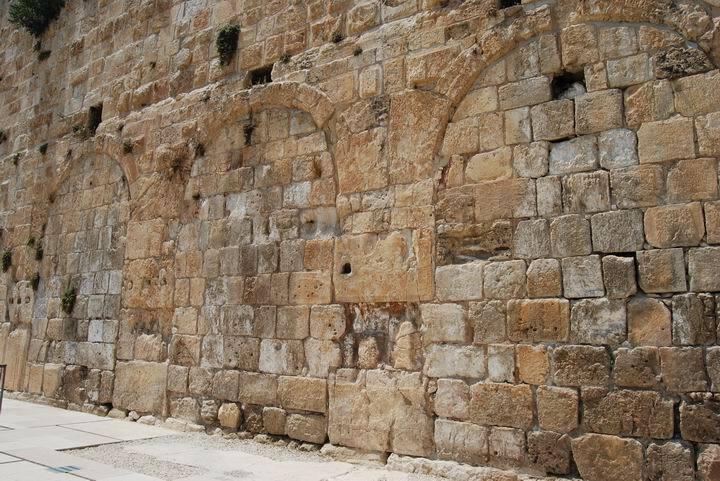 The gates are sealed now, since the Arab or Crusaders times, but their traces can be seen on the exterior south-eastern wall. There was a triple-arch gate on the eastern side (seen below), and double-arch gate on the western side. The original eastern triple-arch gate of the Herod temple does not exist, and only the traces of the openings remained, blocked and assimilated into the walls. This is visible in the picture below. During the holidays and busy days, the eastern gates were used for entry to the Temple, while the western gates for exit. This is illustrated in the figure on the right. The only exception was for visitors in periods of mourning, which entered in reverse direction, so the public will know about their loss and wish them well. In quiet days, with fewer visitors, the entry was through the middle arch only. The monumental staircase was more narrow on the eastern (entry) side. The reason may have been since the entrance to the Holy temple was regulated, and the visitors had to present a certificate that they were purified after visiting a Mikveh (baptismal) before entering God's place. A closer look on the triple-arch Hulda gates on the eastern side is seen below. The gate is 15M wide and was designed as a triple arch to support this width. The grand decorated capitols that once were part of the gates were smashed after the fall of Jerusalem. 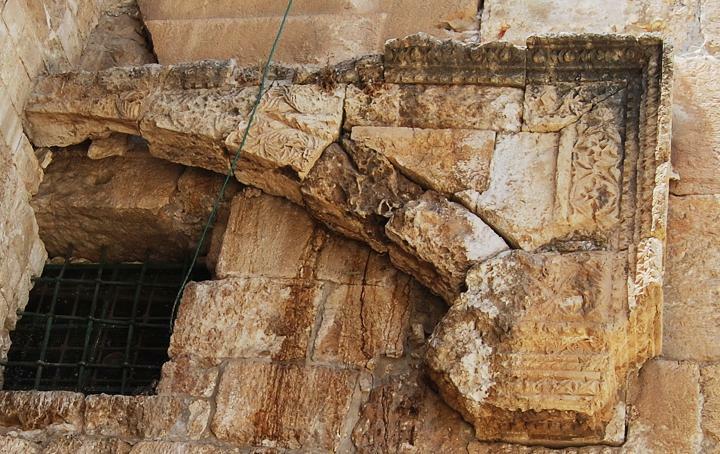 The excavators found many of the second temple fragments that once decorated these gates. The double-arch gate on the western side are mostly hidden by the medieval structure. Only the east most side is seen. This section has a decorated capitol on top of the arch, which is missing today on the eastern triple-gate. The tunnels behind the sealed gates are not open to the public. The excavator of the southern wall describes in his book a visit to the other side of the wall, where he found traces of the Herodian grand structures which were part of these tunnels. South to the monumental staircase are many ritual baths, used for purification of the visitors before entering the temple. There are dozens of such cisterns and Mikveh (baptismal) installations, similar to the south-west side. This is a view of the south side of the temple - the Ophel. You can see the dozens of cisterns and ritual baths and reconstructed residential buildings from the 2nd temple period (1st C BC to 1st C AD). On the bottom right side is a large rock-cut pool. On the background is the mount of Olives. The large rock-cut pool, seen in a detail in the photo below, was probably a water system under the Acra fortress built at the Ophel by the Seleucids during the 2nd C BC. More Hellenistic period structures are located near the pool. A Byzantine residential house (6th-7th C AD) was uncovered under the Umayyad palace on the south side of the temple mount. The plastered walls and mosaic floor of one of the rooms are seen in the following photo. The mosaic stones are white, and the decorations are red and black. There are other rooms, rock-cut cavities and courtyards. Some rooms in the Byzantine residential houses, that were excavated, were used for light industry, such as textile and copper. These industries supported the Byzantine tourism industry - preparing and selling Christian souvenirs. On the south side of the temple mount is a tall tower, erected by the Crusaders as an observation tower. It was also used during the middle ages. The access was from the temple mount, as seen in the photo below. The Silver dome of the Al-Aksa mosque, which was converted by the Crusaders to Baldwin's royal palace, is just behind the tower. Today, there is a staircase from the archaeological park (on the left side), and along the walls (on the right side, seen also on the next photo). This is the panoramic view from the observation tower - the area of Kidron valley, south of the old city. 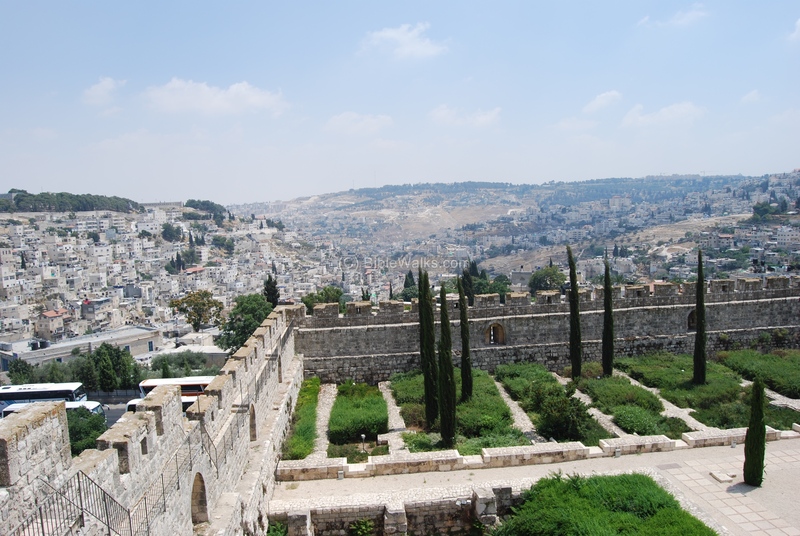 Also seen from the terrace: Mount of Olives (to the left), the Southern Walls excavation area (in front and to the right), Mount Zion and the Jewish quarter (to the right). A large Umayyad palace once stood at this area. For more information on the southern wall excavations - see a separate web page that covers the south-western side. A new discovery was made after sifting through an ancient dump in the Ophel site. This is a bulla (seal) of King Hezekiah of Judah. This small ~1.2 cm (0.5 inch) clay seal is stamped with Hezekiah's name: “Hezekiah [son of] Ahaz, king of Judah”. It is the first time an impression of a Judean or Israelite king's name was found in an archaeological excavation. It also features a 2 winged sun, a smiliar figure that appears on Hezekiah's LMLK seals. King Hezekiah reigned from ~727 to 698 BC, and is portrayed favorably in the Bible (2 Kings 18:5): "...after him was none like him among all the kings of Judah, nor any that were before him". Watch this video, courtesy of Dr. Eilat Mazar, the director of the excavation. 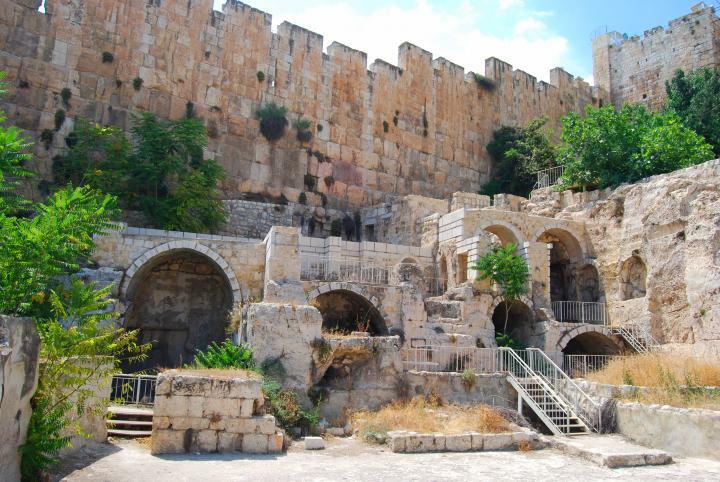 The Hulda gates name comes from the prophetess Hulda, who resided in Jerusalem. 2 Kings 22:14 : "So Hilkiah the priest, and Ahikam, and Achbor, and Shaphan, and Asahiah, went unto Huldah the prophetess, the wife of Shallum the son of Tikvah, the son of Harhas, keeper of the wardrobe; (now she dwelt in Jerusalem in the college;) and they communed with her"
2 Chronicles 34: 22: 22 "And Hilkiah, and they that the king had appointed, went to Huldah the prophetess, the wife of Shallum the son of Tikvath, the son of Hasrah, keeper of the wardrobe; (now she dwelt in Jerusalem in the college:) and they spake to her to that effect". 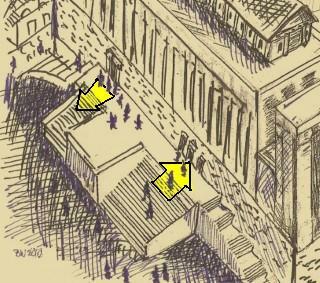 "Five gates were in the temple mount: the two Huldah Gates on the south, that served for coming in and for going out...". The Hebrew name "Ophel" was translated to "forts" in the KJV version of this text where Isaiah describes the ruins of the city. "Because the palaces shall be forsaken; the multitude of the city shall be left; the forts and towers shall be for dens for ever, a joy of wild asses, a pasture of flocks;"
"He built the high gate of the house of the LORD, and on the wall of Ophel he built much". "Now after this he built a wall without the city of David, on the west side of Gihon, in the valley, even to the entering in at the fish gate, and compassed about Ophel, and raised it up a very great height, and put captains of war in all the fenced cities of Judah". "Moreover the Nethinims dwelt in Ophel, unto the place over against the water gate toward the east, and the tower that lieth ou. After them the Tekoites repaired another piece, over against the great tower that lieth out, even unto the wall of Ophel." "But the Nethinims dwelt in Ophel: and Ziha and Gispa were over the Nethinims." Josephus, the Commander of the Jewish revolt against the Romans, and later a historian of the period. He describes the siege and fall of Jerusalem, and describes the fortification of the city, including Ophel (Ophlas). "Now, of these three walls, the old one was hard to be taken, both by reason of the valleys, and of that hill on which it was built, and which was above them. But besides that great advantage, as to the place where they were situated, it was also built very strong; because David and Solomon, and the following kings, were very zealous about this work. Now that wall began on the north, at the tower called "Hippicus," and extended as far as the "Xistus," a place so called, and then, joining to the council-house, ended at the west cloister of the temple. But if we go the other way westward, it began at the same place, and extended through a place called "Bethso," to the gate of the Essens; and after that it went southward, having its bending above the fountain Siloam, where it also bends again towards the east at Solomon's pool, and reaches as far as a certain place which they called "Ophlas," where it was joined to the eastern cloister of the temple". Ophel- In Hebrew - the name of the fortified hill on the south-east of the temple mount. Its root name in Hebrew is o-ph-el, which means "climb" or "ascend". It was translated to "tower", "hill", "cliff" or "fort" in various translations. Hulda - the name of the female prophet (see Biblical references), who resided in Jerusalem and prophesied at the time of Josiah and Jeremiah (ca. 600 BC). Thanks to Werner Gugler for this correction. According to tradition, her grave or monument is on the top of Mount Zion. Hulda Gates - The actual source of the name is not known. In Hebrew the name means "rat" (Khulda) or "mole" (Kholed), but . Maybe the habit of the rat to use tunnels and climb out to the surface resembled the design of the tunnels into the temple. Meir Ben-Dov - "The Dig at the Temple Mount", Keter Publication 533340 . The book tells the story of the excavations, and provides theories that back the findings.